As the Itron® Riva Developer Community grows, we aim to foster an open exchange of ideas and resources with you, our customers and partners, that will lead to the discovery of strategic solutions at a transformative pace. Itron is fostering an open exchange of ideas and resources, with an aim to expand the open ecosystem on our core Itron Riva technology platform. Itron Idea Labs, a center of innovation within Itron, pursues new business models quickly, fearlessly and relentlessly. At Idea Labs, we are working closely with incubators and accelerators to champion innovation in the growing community of developers investing in smart energy and water solutions for the future. We invite start-ups, independent entrepreneurs and established companies to bring your best-of-breed thinking and capabilities to Itron, where you can find development boards and resources that enable discovery and innovation around the Itron Riva technology. Designed to connect visionary companies with resources to jumpstart solution development, the Itron Riva Innovators Program delivers valuable access to Itron technical and commercial teams, making it possible for participants to fine-tune solutions in a lower-risk environment. Using the Itron RIva Dev Edge board (with RF and PLC cards in the stack), Comtrade has demonstrated that Itron Riva can deliver real-time monitoring of power line sag caused by ice buildup, temperature or other data that can be sensed and measured. Freezing rain occurs when liquid raindrops, formed in a layer of warm air high above the earth’s surface, fall into a layer of freezing air near the ground. If the layer of freezing air is thin enough, raindrops do not have time to freeze before reaching the ground. Instead, the water freezes on contact with a surface, creating a coating of ice on whatever the raindrops touch. You may have seen this happen to your car on occasion, or on your driveway. Freshly fallen snow and heavy rain can all make a rush-hour commute frustrating, but freezing rain is perhaps the most deceiving and destructive of all winter precipitation. Power lines coated with ice become extremely heavy (just 1/4 of an inch of accumulated ice can add about 500 pounds (230 kg) of weight per line span), causing support poles, insulators, and lines to break. Due to the benign nature of the initial rainfall, the onset of freezing rain may go completely undetected until ice begins to accumulate. Numerous de-icing methods exist to remove the ice from a particular surface. However, to make removal effective, obtaining real-time data is required through continuous monitoring of temperature and the sag of parts of the power system. Obtaining this data can be challenging, particularly in remote areas with difficult access. Comtrade Digital Services has developed a prototype to prove that Itron Riva can be used in combination with cost effective sensors to deliver real-time monitoring of power line sag caused by ice buildup, temperature or any other information that can be sensed and measured in the field. A simple, inexpensive, yet robust flex sensor is installed on certain points of the power line and connected to an Itron Riva node (in this case an Itron Riva dev edge board with RF and PLC cards in the stack). The sensor’s resistance changes when it is bent and can thus be used to measure power line sag due to forming ice. Itron Riva nodes make up an OpenWay Riva mesh which employs Itron’s adaptive communications capability to send sensor values periodically to the Itron Riva root. The root acts as an aggregator, gathering data from the Itron Riva nodes and uploading the data to any cloud (e.g. MS Azure) where it can be processed. By analyzing the sensor values displayed on a graph, it can be easily determined whether the sag effect is due to ice buildup or some other effect (such as birds, wind, etc.). For example, upon sensing ice related sag on the line, work crews can be dispatched to the exact location where ice buildup presents a safety concern. De-icing techniques can be employed (e.g. heating of ice-covered line conductors by electrical current, for example by load shifting method which consists in using the heating effect of load currents to prevent conductor icing or to remove ice form conductors. High-voltage lines carry limited current and do not generally produce enough heat to prevent or melt ice so normal operating conditions must be modified in order to force more load current through a particular circuit by transferring or shifting loads from other circuits linking the same two substations). The same setup can be used with sensors designed to detect temperature, lightning strike, wind, humidity, wire sag due to heat, or other conditions. Predictive algorithms can then be employed to predict a chance of power line failure based on historic data well before the event occurs, thus providing a prioritized list of potential trouble spots and giving maintenance teams more time to react. The Itron Riva Dev boards were ideally suited for this use case, allowing Comtrade to create a microcosm of the OpenWay Riva network – thereby proving the feasibility of detecting ice buildup (or other conditions which would warrant line maintenance) to pinpoint lines in need of immediate preventive measures. To detect earthquakes earlier, enhance public safety and mitigate damage from secondary hazards such as fire, Omron Creative Labs of Omron Electronic Components LLC and Itron Idea Labs teamed up in a development effort. Prototyping activities resulted in development of the Omron D7S Seismic Sensor which detects and evaluates seismic activity using the Itron Riva Edge Development Kit. To achieve this vision, Omron Creative Labs took the Itron Riva Development Kit and created a seismic sensor daughterboard to gather seismic activity, ground acceleration and velocity data using an Itron Riva peer-to-peer network. The house atop a shake table isoutfitted with the Omron Electronic Components LLC’s seismic sensor featuring Itron Riva edge intelligence. Activating the shake table via a tablet device simulates an earthquake. 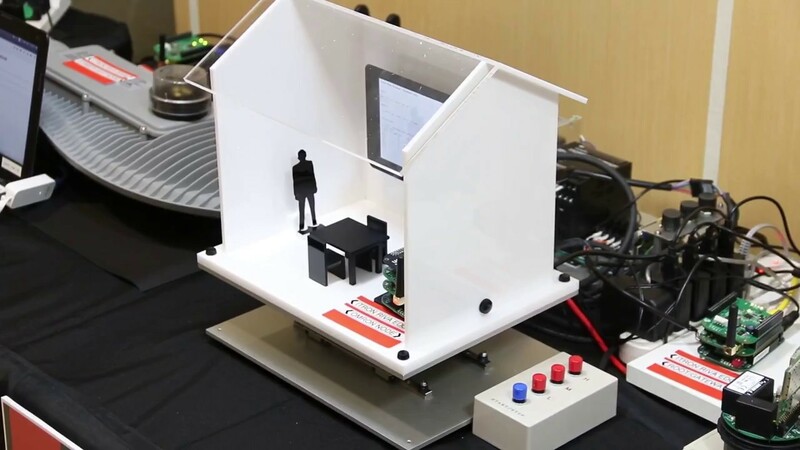 The seismic sensor located in the dollhouse detects the motion of the shake table and sends an alarm message through the Itron Riva network to a natural gas valve for automatic shut off. The combination of the Omron Electronic Components LLC’s seismic sensor and Itron Riva platform demonstrates how modern urban infrastructure can be used to automate important safety tasks across utilities and public agencies to improve the outcome after a natural disaster, such as an earthquake. With next generation technology, it is possible to revitalize existing city infrastructure and integrate technology into the physical environment to enhance and improve the economy and safety of a city and the daily lives of its citizens. Itron's own business accelerator, the Idea Labs, places high priority on cultivating a thriving environment of discovery and learning. The Itron Idea Labs internship program illustrates the diversity and entrepreneurial spirit of our developer community. Coming from all different walks of life, the interns bring knowledge, insight and intensity to Itron Riva Enablement, while benefiting from the opportunity to be a part of the innovative development occurring within Itron.